There is no denying – they grab the attention from across a crowded room. Constructed to stand twice as high (or higher) than the average 10×10 displays, the double deck display exhibit is nothing short of a work of art. Certainly a double decked trade show exhibit will be more of an investment in your company’s brand than an eight foot table, however, consider the opportunities you’ll have with the additional traffic to your booth. Also – did you know you can RENT a double deck? That’s is right. E&E Exhibit Solutions offers a wide range of custom exhibit rental designs. As you look over the trade shows in which you’ll participate for 2015, consider renting a show piece display for the biggest event of the year. Is the convention hall ceiling high enough and does show management allow double deck displays? What additional electrical needs will be required with the custom exhibit design? How much additional time and budget will need to be allotted for installation and dismantle of your double deck exhibit? Will additional personnel be needed to appropriately staff the double deck exhibit? What are the fire codes for the tradeshow city? Are Double Deck Exhibits Right for Your Company? Do You Want to Stand Above the Crowd? Would our tradeshow booth display benefit from a second level to use for additional selling space or as a private conference room or a lounge to entertain customers? Do we want to make a statement at our next convention with a double deck exhibit? Are we able to afford the added investment in a double deck exhibit to create a show-stopping presence at our next round of tradeshows? Check out the renderings of an exciting double deck design we created for one of our customers. 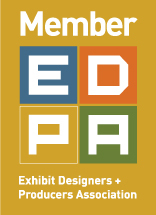 For more information on double deck displays exhibits, read the article Get the View from the Top with a Double Deck Trade Show Exhibit by E&E Exhibit Solutions President Daniel Chaddock.